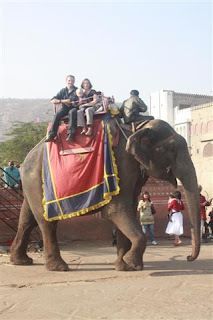 Justin kept saying that when he went to India, he was going to ride an elephant. Ride an elephant, ride an elephant like a refrain. When I suggested we could also wait on an elephant ride until Thailand (if we get there), he said, "No." So it was a mini-mission to find an elephant to ride in India. We found this elephant in Jaipur, near the Amber Fort. We rode, and lo, it was wonderful. My brother also sent this shot along as a compliment to my current profile picture. You know, I felt ridiculous taking my own picture (though not so much as to not!) but seeing a picture of me taking my picture: it's a new ridiculousness. 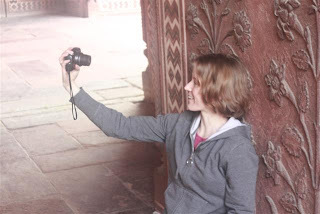 Hi you all, I´ve really enjoyed Sarah´s colorful and so passionate (I try to mean full of feelings) descriptions of everything.Plus she´s a great tourist guide- I don´t need to go to India nor Kuwait anymore, I have a clear picture. Reading Sarah is a cheaper way of travelling- and much funnier. I´m so glad that you´re all so happy and making the best of every moment. Claire looks gorgeous! I´m sending as anonymous - I don´t have any accounts. Haha...I can just imagine Justin chanting, "Ride and elephant, ride an elephant" as persistently as a 5-year-old. However, I agree that is something that must be done at first opportunity, because hey, I want to ride an elephant someday! On our trip to the Amazons I got to check something off from my travel experiences list: feeding monkeys. It was rather entertaining to say the least. Check out our blog if you want to see a video. Claire is looking super cute, keep up the good work! Now I can picture a picture being taken of you taking a picture of you. Now all we need is a picture of my seeing you on this blog picture and it would be a picture of ... oh, never mind.